Welcome to the "Spring Cleaning" giveaway event! 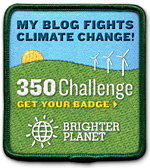 If you're ready to head to the store to buy (green, right?) cleaning supplies, then don't forget to take this $100 Wal-Mart gift card with you! This giveaway is sponsored by Tip Hero and is brought to you by some fabulous bloggers and the opportunity to win a prize that's sure to help you with your spring cleaning efforts! 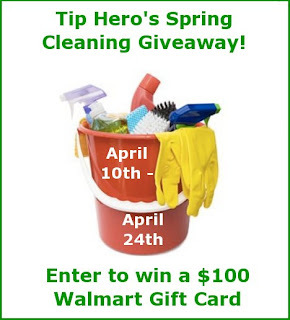 To enter the $100 Walmart giveaway and to learn more about Tip Hero, click on "read more!" Tip Hero features many tips that can help you save money on spring cleaning. Their free homemade cleaners ebook, for example, features some great homemade cleaner recipes from both the blog writers and readers! This giveaway for a $100 Walmart gift card (delivered electronically or through snail mail) begins on April 10th and will run until April 24th at 11:59pm US Eastern time. Open to residents of the US only, 18+.